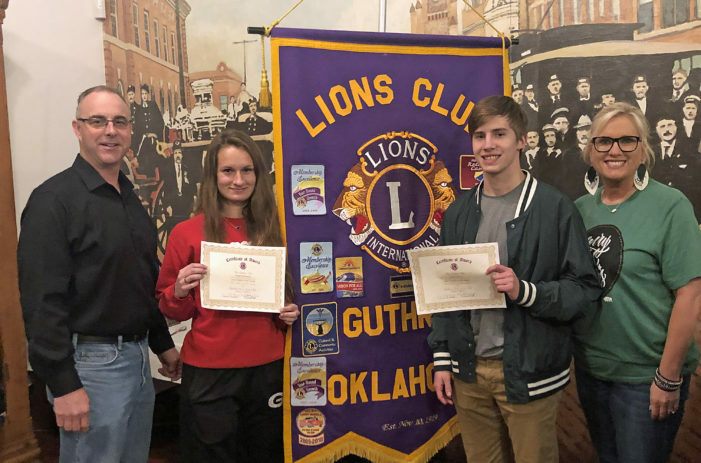 Guthrie High School students Denae Davenport and Caleb Nelson were selected and honored by the Guthrie Lions Club for students of the month for March. Denae, the daughter of Brad and Deanna Davenport, stays active in many programs and clubs at GHS. She has been a member of the GHS track and cross country programs, National Honor Society and Mu Alpha Theta. Denae has been recognized for her classroom work by being named a school valedictorian. She plans to attend University Central Oklahoma and major in general studies. Caleb, son of Asa and Audra Nelson and Candi Campbell, participates in wrestling and tennis. He’s a member of National Honor Society and GHS student council. Caleb attended Boys State and is well-known for athletic skills as a three-time wrestling state qualifier and a two-time first team Suburban Conference wrestler.